Looking for something to satisfy your sweet tooth? When a plain candy bar isn’t enough for your sweet cravings, try our decadent coconut date rolls. This dried fruit sweet treat is not only sweet, but a healthy alternative to candy. 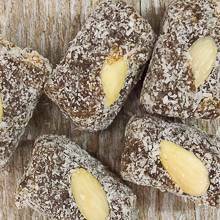 Rolled dates with a half almond in the middle and covered in coconut…what’s not to love?! Price quoted is per pound, not including shipping.